Just about a year ago, my good friend, multi-instrumentalist and baroque music specialist, Lars Baunkilde, played me a recording of J.S. Bach’s “Refugee Cantata” with the Enghave Barok ensemble on which he played the violone. Lars was very proud of the performance. He said that he felt that the ensemble had succeeded in capturing what was all too often lacking in interpretations of Bach; rhythm and emotion. Enghave Barok is a small chamber orchestra consisting of the crème de la crème of Scandinavian baroque musicians. They are specialised in performing J.S. Bach’s cantatas, passions, oratorios and masses. The sound of the recording was immediately engaging. It had a presence and intimacy that I had not previously experienced in classical recordings. The recording had a sense of depth that reminded me of what Frans is realizing with our recordings; an almost three dimensional sound stage. I know first hand, that the only way to achieve that is through real knowledge of microphone placement and a deep understanding of phase. Lars could not answer all my questions regarding the technicalities of the recording but offered to set up a meeting with the two men responsible for the recording. So a couple of days later I found myself in the cozy little Enghave Church in Copenhagen, having coffee and Danish pastry with organist, conductor, producer and assistant engineer Christian Dehn Bang and head engineer Torsten Jessen. Hearing Torsten Jessen talk about microphone placement and the mysteries of phase is like talking to Frans de Rond. The two men have a very similar recording philosophy; old fashioned craftsmanship paired with modern technology, and both men use the term visual, when describing their approach to recording and mixing, a lot. Christian believes that Bach has to swing, his music should be played with a natural flow. He is very proud of his ensemble. Each musician is an expert on his instrument. And all musicians prepares vigorously, so already at the first rehearsal the ensemble is no longer concerned about the notes but can concentrate fully on the music. Christian explained that, one of the benefits of such a small ensemble, is that it‘s possible to let everyone have an opinion about the interpretation of the music. And since Bach’s music, with it’s sublime polyphony, gives each instrument a voice, he find it very important to let the interpreters of these voices all have their say in the interpretation of the music. Because of this way of working, the rehearsals might take a bit longer but the result is that you have a group of completely committed musicians, singing and playing their part with complete devotion. That probably explains the freshness and the drive that I am hearing on this recording. Torsten and Christian are recording and mastering in 96khz. They find the increased audio fidelity more than worth the trouble. They then downsample the master to 44.1 for the CD releases and the broadcasts on the Danish and European radio stations. During our conversation it became clear that we were having a very similar philosophy regarding music and sound, and that our little label would be a natural choice for releasing the audiophile versions of their excellent recordings. "International elite on the West Side of Copenhagen. Enghave church has been programming concerts with the most prolific musicians specialised in Baroque music ….unsurpassable level of performance!" Søren Schauser, music editor at the danish newspaper "Berlingske Tidende"
"Full house and baroque music played with fire on the West Side." These musicians play straight from the heart, enthusiastic, swinging and in complete agreement with the music.....if this level can be kept on future releases I will be first in line…. Plenteous expertise from the ensemble but you'd have to pick out Jesenka Balic Zunic's tender playing on the Violoncello da Spalla, Jakob Bloch Jespersen in ideal repertoire for him, and the striking freshness and fluency of Anna Jobrant's soprano solos. It was free, and full. 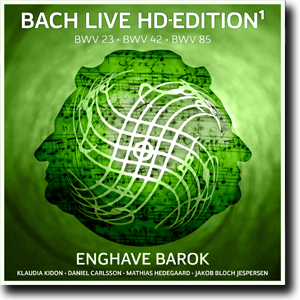 The Danish National Radio (DR) has transmitted some of Enghave Baroks concerts on the classical music channel DR P2 and distributes these concerts to other european countries via The European Broadcast Union (EBU).